NTS Graduate Assessment Test GAT General 2018 iii online Registration from here. Last date to apply is Monday, 11th June, 2018. Graduate Assessment Test is organize for the purpose of admissions in MS/M.Phil programs. The validity of GAT result is for the period of 2 years. Those students who wants to apply for GAT General must have 16 years of education. GAT Graduate Assessment Test has two categories. First is name as Gat General Test. While the second category is name as Gat Subject test. Gat Subject test is organize for Ph.D programs. NTS will conduct the Graduate Assessment Test GAT General 2018 III test. Candidates can apply online for the GAT General. 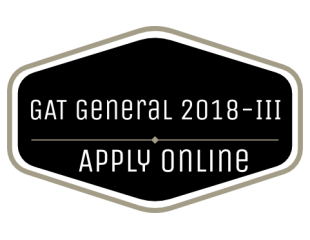 The eligibility criteria for GAT General 2018 iii is mention below in the table. In GAT subject their are total of 100 questions. All these questions are multiple choice questions. Each question has mostly 4 answer out of which one answer is correct. The GAT is organize for the purpose of analyze the Quantitative as well as analytical skills of the students. Description: Biological & Medical Sciences Students. Description: for Physical Sciences Students. Description: for Social Science Students. Online registation process for GAT General 2018 test is mention below. First of all get yourself registered for the GAT subject test.